At the moment a guest enters a party space, every aspect should capture their spirit and feelings. All senses should be seduced, including sight smell, sound, touch and taste. If done properly, each element will collectively create an overall style, and reflect host's personality. Whatever your celebration, Great Beginnings Events is here to handle all the details and remove the stress so you can enjoy and savor every moment of your special day, event, or party. No detail will be overlooked. Having worked with numerous clients through the years in consulting, planning , and designing avariety of special occasions, we know that no two are exactly alike. Each event has been as unique as the individual it was planned for. 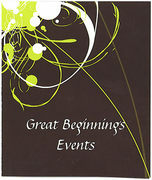 Relax and let Great Beginnings Events help make your special day unforgettable!